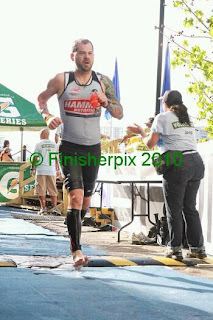 So after an amazing race in San Juan, I left to join a friend and train together in St. George for the upcoming St. George Ironman in just a short 41 days from now. 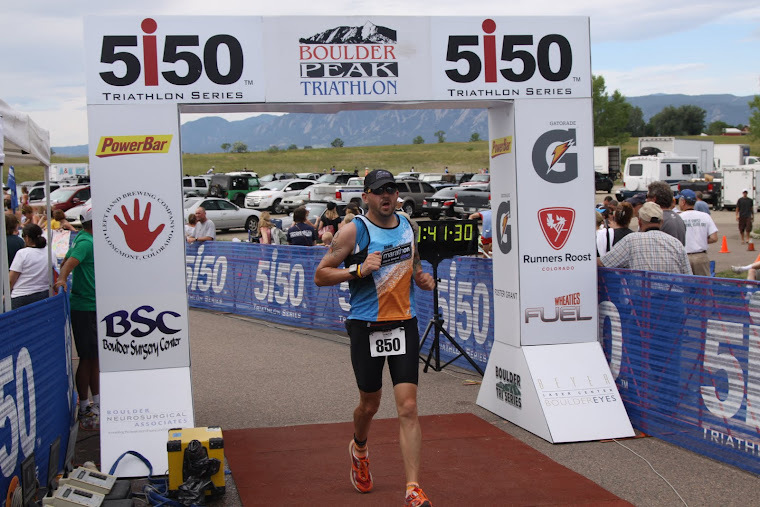 While I was not 100% and my legs felt like jello, I was able to muster a 2 mile swim followed by a 88 mile bike ride, fighting back full leg cramps riding up Eagle Mountain, the wall, and Veyo. Hitting cattle crossing #1, I blew a tube and had to stop and change a flat! Review of Day 1 of IM St George training. 2.0 mile swim in 1:25 1107 calories burned. 88.05 miles on the bike in 5:53 7750 calories burned. 1 flat over Cattle crossing. Cramps in both legs atop Eagle Mountain and the wall. Today I was the most disapointed in myself I have ever been. I let my head get in my own way! My legs felt like jello the whole ride. I started to question whether or not I could do this. A several points I told myself I couldn't do it and was going to drop out. I guess now that I finished it, time to baby my legs in an ice bath, epsom salts and spearmint, and lots of pizza and carbs. Day 2 had a 60 mile bike ride, riding the full bike loop I felt a little better but still not 100%. Spent the previous night enjoying a spearmint epsom salt ice bath and my roller stick. I felt as though I was killing the course today, Eagle Mountain, the wall, and Veyo, this time with 20 mph headwinds, a ten degree temperature drop, and overcast skies! 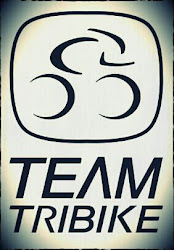 Keep in mind my TT Tri Bike is still in shipping and repair from Puerto Rico where it was scratched during shipping. I was able to build my confidence up and realize with my bike and fresh legs, that I can do this! Review of Day 2 of IM St. George training. I am listening to my body. I'm done. Time to recover and train smart for St George in 5 weeks. Today ended rising 53 miles, basically one loop of the course with 20mph head winds, 10 degree temp drop, and overcast skies in 3:40 averaging 17mph burning 5555 calories and taking the wall like a badass. It is no longer as scary a course as I first thought. On the run my left IT flared up and my body pleaded for me to stop, 7.75 miles after getting lost in Dixie State College campus in 1:14 and burned 967 calories. Headed home tomorrow for a dry needling treatment and sports massage. 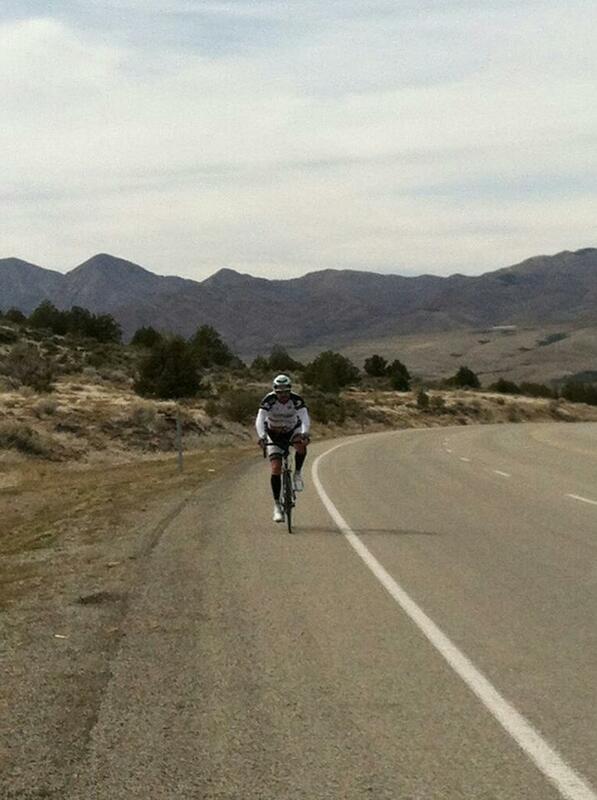 Taking a few days of rest and recovery and then will be ready to start training and tapering for St. George. Take care everyone and train smart! 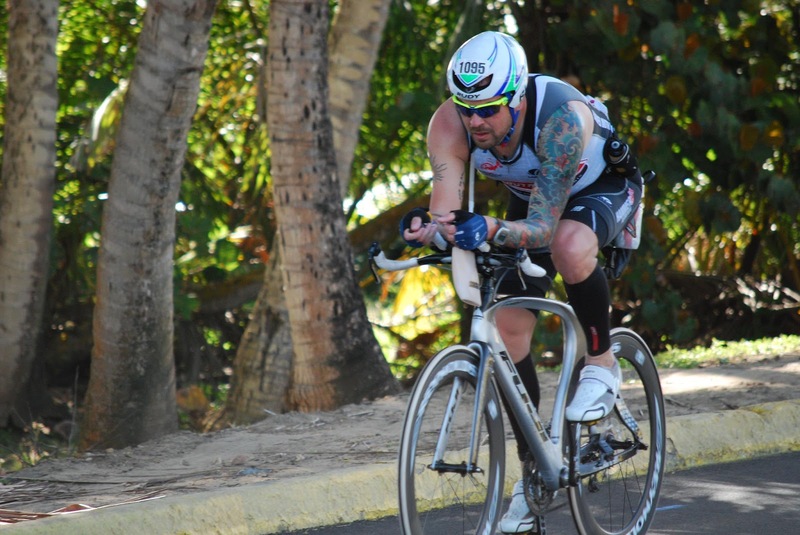 I had an absolutely amazing time in Puerto Rico, a training 70.3 to get me ready for IM St. George coming up in a short 5 weeks. While I feel somewhat comfortable with the swim and the run, the bike still scares me. It is a tough, uphill course with very little forgiveness. 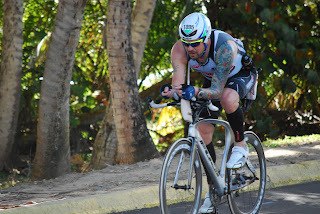 I am headed there again this weekend to train on the bike, unfortunately I won't have my TT bike as it is still being shipped back from San Juan but should be a great training nonetheless. The swim was open water in a lagoon, very salty which helped with the buoyancy and hot, water temp was around 78 degrees at the start. It had a slight current but was otherwise smooth, as I reached the 1100m mark, I noticed I was swimming with a manatee. Pretty amazing. After we crossed the 1200m buoy, the current became a little stronger and the waves from the opening to the Atlantic rocked us, making me somewhat sea sick. I completed the swim about 7 minutes slower than training at 41:38. With about a quarter mile run from the water exit to T1, I transitioned to the bike. I have never felt as comfortable on the bike as I did that day. I must thank my coach, Jeff at PRSFit in Estes Park Colorado for the amazing workouts and preparation. I averaged 22mph on the bike, which was hot and mostly flat with two rather challenging hills towards the end. My feet went numb around mile 40, from what we are guessing was swelling from the heat and humidity within the shoe. Bike time was 2:52. T2 to the run was somewhat challenging with numb feet, I regained feeling and subsequent pain around mile 3 as we turned the corner to hit the first of the challenging hills on the run course. It was about a 9% grade for 100 yards directly in the sun with a headwind towards the Atlantic. Once at the top it was beautiful and level until we took the first downhill to run along the water. Turnaround to head back up was a 1.5 mile steady uphill on uneven blue cobblestone paths. Tourists trying to navigate the fort around us made traffic somewhat difficult as well. I was really starting to feel the heat and my first run split was 9:55. Second run split I pushed myself, throwing ice down the tri kit top and bottom to keep cool and throwing down as much cold water and gatorade as I could get. 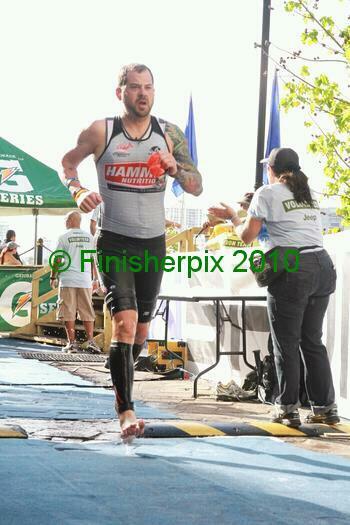 Second run split was an 8:22, much improved as I wanted to reach my 30 minute PR from IM Augusta last September. While I did not reach that PR, I was able to PR in PR by 15 minutes and gain a much needed confidence boost with St. George just around the corner. I learned alot about nutrition in this race that I can take forward with me. 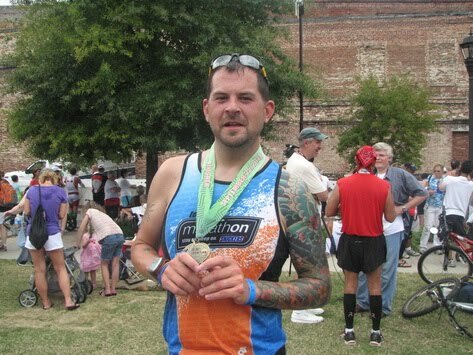 All in all 5:44:44 and I felt great afterwards meeting some great new friends along the way. 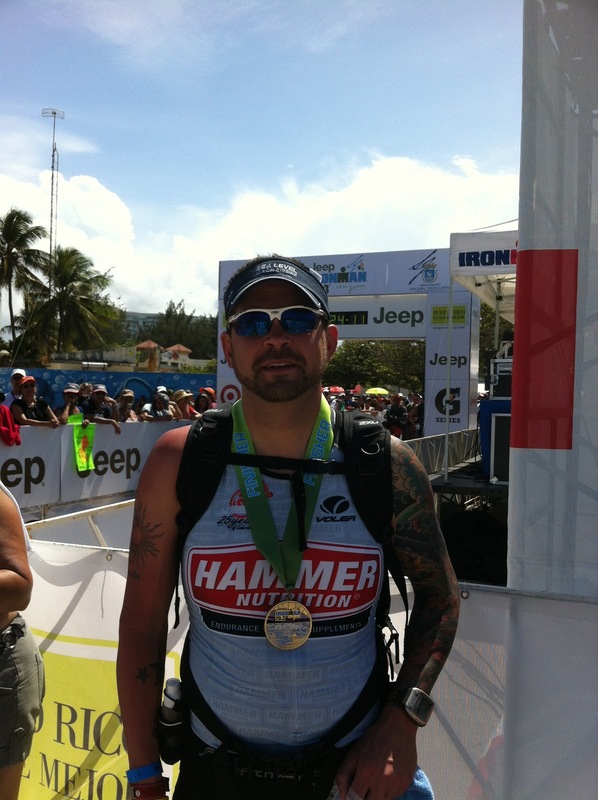 I must take a moment to thank my incredible Ironmate, Carlos, for being there to help push me when I just thought I couldn't make it any further. Sharing in his excitement for me and where I have journeyed to, makes it all that much better. So now comes the scary part, atleast for me being a Paramedic. I noticed on the plane ride home that my legs began to swell and become extremely painful even with my compression sleeves on. When we landed in Denver after 12 hours of travel on planes and from sea level to home at 8500ft above sea level I was up all night in excruciating pain and discomfort. I was obviously retaining water, almost 15 pounds from the time we left San Juan to the time we made it home at midnight last night. This morning, I was finally able to output some of the water and have been doing so at about 200cc's every 30 minutes. The swelling has gone down and I once again have ankles. I took a spearmint epsom salt bath, elevated my legs, and am using full compression socks. All of which I believe helped. I also took the advice of some athletes on Facebook to elevate my legs in a 90 degree position up a wall and milk some of the fluid out. 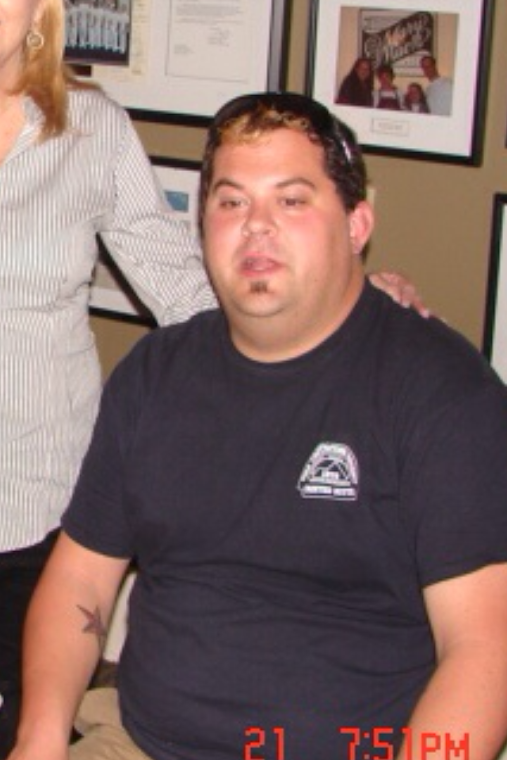 I have also decreased any sodium intake and increased vitamins and minerals to help push out or reabsorb the fluid. I think tonight is a recovery night of elevation and epsom salt baths. Training can resume tomorrow with an early morning swim and then a weekend of riding and running in St. George. As it gets closer I get more and more scared, but it will be one hell of an accomplishment. 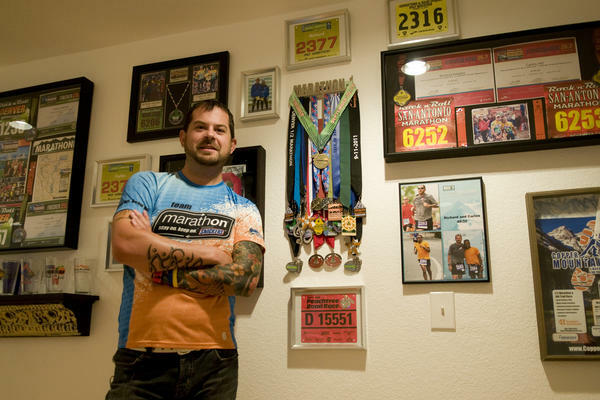 Thank you to everyone for your continued support and I hope to be able to thank you all again as I cross the finish line in St. George on May 5th. French Fries that are healthy! This can't be true! Cut squash into French-fry-shaped spears, using a crinkle cutter if you've got one. Thoroughly pat dry. Lay spears on the sheets and sprinkle with salt. Bake for 20 minutes. Flip spears and bake until mostly tender on the inside and crispy on the outside, about 15 minutes. Enjoy! Yes, I know it's been a while! Life has been going at full speed for I don't know how long! As I approach Ironman San Juan in a week, I am excited to see that I have been able to help, motivate, and push others to reach their goals! I am proud of my group of friends first, and clients later. This weekend we prepare for what for many will be their first running event, the Runnin of the Green in Denver. I can't express how happy I am to see the successes of others. 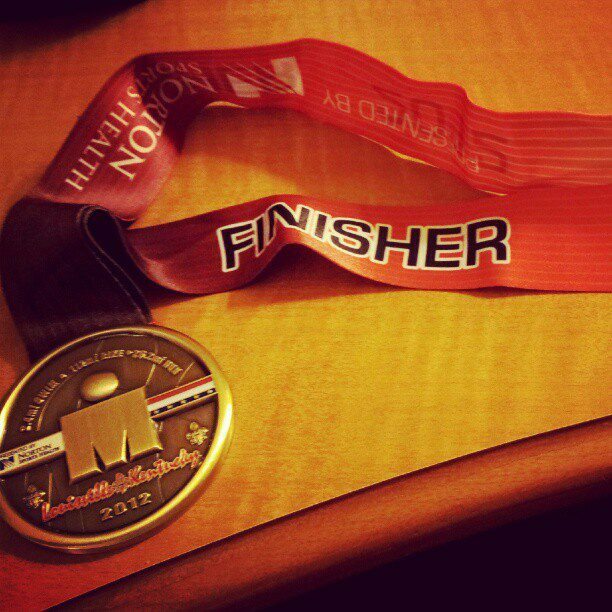 Today marked another great day in my journey, as I was once again invited to be part of Team MARATHON Bars. I look forward to yet another race season of promoting such an awesome brand. Make sure you check them out, or contact me for samples! 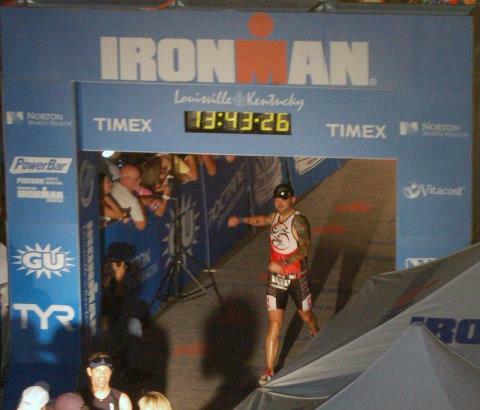 Continue to train hard and I will be posting more as I get ready for the first of 4 Ironman events in 2012! STAY ON! KEEP ON! 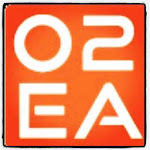 in 2012!